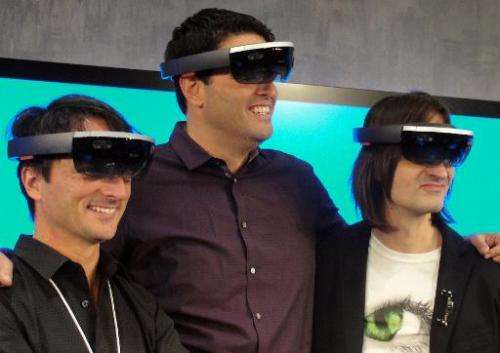 The US technology titan debuted its HoloLens capabilities built into its coming Windows 10 operating system and showed off goggles that let wearers use their hands to interact with virtual objects. "Until now, we've immersed ourselves in the world of technology," Microsoft's Alex Kipman said introducing HoloLens at a press event at the firm's Washington state headquarters. Microsoft chief executive Satya Nadella touted HoloLens and Windows 10 as a "mind-blowing" experience that will open a new type of computing. Industry tracker Forrester predicts that what it refers to as mixed-reality computing will catch on by the year 2020, and include Internet giants Apple and Google weighing in with holographic offerings. Millions of people will likely buy HoloLens by the end of next year, especially if Microsoft targets entertainment and particularly games who are proven early-adapters of technology, according to Forrester. "If successful, HoloLens will ultimately expand the way people interact with machines just as the mouse-based interface did in the 1990s, and touch interfaces did after the introduction of the iPhone in 2007," said Forrester analyst James McQuivey. HoloLens also has the potential to radically improve how firm's operate when it comes to collaborating from afar, training employees, and tending to work outside offices, according to Forrester analyst J.P. Gownder. It is a 3D display, but it is not a hologram. I guess they can call it anything they want - but it seems misleading and kind of a stupid name. 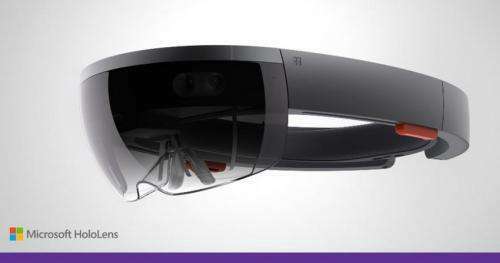 Don't mean to be a buzzkill, but leave it to Microsoft to turn something uber-cool like holo-goggles into the most uber-nerdy looking hardware possible. For Gates sake, just wear the box they come in why don't you. Given Microsoft's long history of orphaning hardware (other than mice and keyboards), I fully expect early adopters to be left at the techno-alter within the next product cycle. Hope I'm wrong, but I wouldn't bet my time and money on it. What is the basis for your "end of next year" prediction? To be fair, at this point the projection mechanism is completely unknown. If I read of such as a kickstarter project, I'd think it was a neat idea. If Microsoft sees this as nothing more than an adjunct to Windows 10, meh. Microsoft often develops interesting hardware, only to turn it over to their marketing group, where it gets corralled into some strategic marketing activity. Which never seems to work out. Then, as AZWarrior notes, are abandoned, orphaned. There's no guaranteed formula for success, but striving to provide open access to, and encourage use by the whole lot of creative minds outside Microsoft is an essential contributing factor. A seminal gesture: a Linux driver. Whew! What could be more bread and circuses? Meanwhile our real physical economy is rotten. How about some desalination out there in lala land? Unless the boffins at M$oft have had a major breakthrough: "HOLOGRAPHIC" is an invitation to a lawsuit if you buy into their stereoscopic eyewear. Their concept video actually has the nerve to portray some of their virtual objects as solid and opaque. Their marketing department needs sending back to school if they think they can project a black object in front of a light background.